The proposal, supported by four City Council members, could mean a standoff at City Hall as a vote on the matter looms. 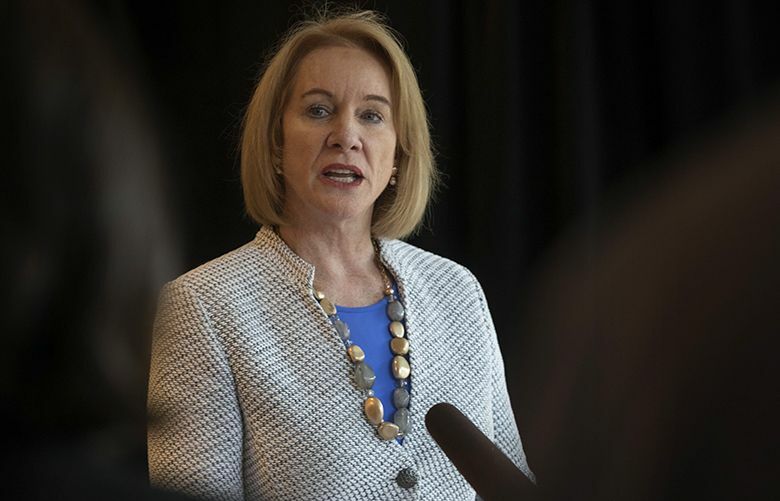 Seattle Mayor Jenny Durkan has her own, smaller proposal for a tax on large employers, and support from four City Council members, she said late Thursday. That could throw City Hall into deadlock, with the mayor and her council backers set against five council members who have been pushing a larger version to help address Seattle’s homelessness crisis. Council members have a crucial finance-committee meeting on the issue Friday. A new law needs five votes to pass and six to override a mayoral veto. The new plan could win support from Amazon and other big companies that have been opposing the larger tax. Durkan’s tax would raise money for homeless services and affordable housing but would be half the size of the measure under consideration in recent weeks, she said. Rather than impose a so-called head tax of about $500 per employee, per year on for-profit companies that gross at least $20 million per year in Seattle, Durkan’s proposal would charge $250 per head, the mayor’s office said. Rather than be replaced by a 0.7 percent payroll tax in 2021, Durkan’s head tax would remain unchanged for five years and then would need to be renewed. Council President Bruce Harrell and Councilmembers Sally Bagshaw, Rob Johnson and Debora Juarez support the mayor’s plan, her office said. “Working with people across our city, we have reached a proposal that has the support of four council members and a range of stakeholders,” Durkan said in a statement. Councilmembers Lisa Herbold, M. Lorena González, Mike O’Brien and Teresa Mosqueda are sponsoring the larger plan, with Kshama Sawant also backing it. “The lack of affordable housing is a crisis for our entire community. We simply don’t have the revenue necessary to fill the gap,” the co-sponsors said in a statement last week, citing Washington state’s lack of an income tax. They have estimated their plan would raise $75 million per year. Durkan’s would raise an average of about $40 million per year, she said. Durkan didn’t immediately provide details on her spending priorities and how they would differ from those set out by the council majority, which wants most of the tax revenue to be used for housing. The mayor has expressed concerns about the $500-per-head tax, which has been opposed by the Seattle Metropolitan Chamber of Commerce and many big companies. Labor unions for supermarket, hotel and home-health workers and others have endorsed it. Union carpenters have opposed it since Amazon announced a pause last week on construction planning for a new office tower. Asked for comment on Durkan’s new proposal, an Amazon spokesman referred to the company’s earlier statement about the pause and the larger tax. Monty Anderson, executive secretary of the Seattle Building Trades Union, said the company told him Thursday it would resume planning were the mayor’s proposal to be approved. In an email, a representative for the Pacific Northwest Regional Council of Carpenters expressed support for Durkan’s plan. “It will allow our city’s carpenters to keep their jobs and continue earning good wages,” Jimmy Haun said. Seattle and King County last year had a shortage of up to 14,000 housing units affordable for homeless people and need to double spending — to $410 million per year — to solve the problem, according to an independent study just released by McKinsey & Company. Following’s Amazon announcement last week, the larger tax’s co-sponsors stressed the scale of the need in Seattle. “(Amazon) recently reported record-breaking profits of nearly $2 billion dollars in one quarter,” they said. A committee vote could come as early as Friday and full council vote as early as Monday.